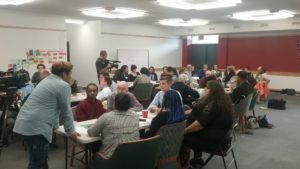 It was a packed house today at CTUL as we held a community forum about the need for strategic enforcement and community partnerships to ensure that the benefits of the ordinances for $15 and ESST in the Twin Cities reach the most vulnerable communities. Join us Friday, October 6th for CTUL’s 10 Year Anniversary Gala Fundraiser! Tickets are $35 at the door or $30 in advance. Click here to secure your advance ticket or to become a gala sponsor. Over 150 striking fast food workers and community allies came out for an action bright and early this morning from 5:30-7:30am at the McDonald’s at 2322 7th St. W., St. Paul. Click here for more. Striking workers travelled the Twin Cities, stopping by St. Paul City Hall to call for $15 in St. Paul, a Burger King in South Minneapolis that has refused to recognize the right to Earned Sick and Safe Time in Minneapolis, and Home Depot in Northeast Minneapolis to stand with contracted retail janitors. Click here for more. Finally the crew came to CTUL to celebrate winning $15 in Minneapolis and to launch the movement to ensure strong enforcement of $15 and Earned Sick and Safe Time in Minneapolis. Click here for more. “Fast food workers strike, demand $15 per hour,” Dana Thiede, Kare 11, September 4, 2017. 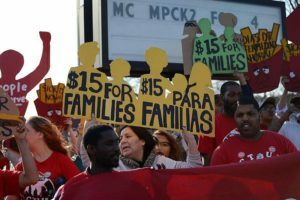 “Striking fast-food workers rally at St. Paul McDonald’s,” Michael Moore, WorkDay Minnesota, September 4, 2017. “Workers March to Continue Push for Minimum Wage Raise,” ABC Channel 5, September 4, 2017. 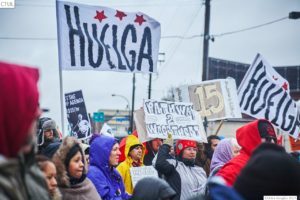 “Given Minneapolis’ racial and economic inequality, and the reflection and exacerbation of that inequality in workers’ experience of wage theft, any effort by the city to address these disparities must be accompanied by a strong commitment to vigorously enforce the city’s $15 minimum wage,” (“Enforcement of a $15 Minimum Wage in Minneapolis Requires Strategic Community Partnerships“, National Employment Law Project, August 31, 2017, page 2). Through years of struggle, low-wage workers in the Twin Cities have won important new workplace rights, including paid sick time in Minneapolis and St. Paul, and a $15 minimum wage in Minneapolis. These victories came because of the leadership of low-wage workers who led multiple strikes, marches, meetings with elected officials, and much more. Now it is up to workers to defend our new rights. Click here to learn how to defend your rights. 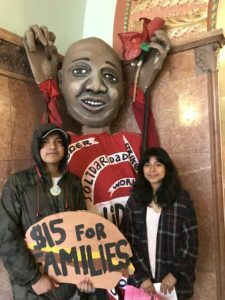 Despues de años de lucha, los trabajadores de las Ciudades Gemelas han ganado nuevos derechos laborales importantes, incluyendo tiempo de enfermedad pagado en Minneapolis y St. Paul, y un salario mínimo de $15 en Minneapolis. Ganamos estas victorias gracias al liderazgo de trabajadores que lideraron múltiples huelgas, marchas, reuniones con politicos y mucho más. Ahora nos toca a los trabajadores defender nuestros nuevos derechos. Hagan clic aqui para saber como defender sus derechos. 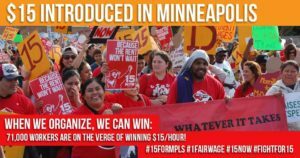 On Friday, June 30th, 2017, the Minneapolis City Council voted 11 – 1 to pass a $15 minimum wage. This historic vote comes on the eve of CTUL’s 10 year anniversary and and years of work with many other organizations fighting to win. 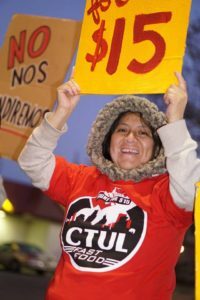 CTUL members have organized to change the conversation and the reality for low wage workers over the last 10 years in the Twin Cities. Beginning January 1st, 2018, the minimum wage will increase to $10.00 and continue to rise until July 1st, 2022, when all workers in Minneapolis will be paid a living wage for large businesses of 100 employees or more. For small businesses with less than 100 employees, the first increase will be to $10.25 on July 1st, 2018 and continue to rise until $15.00 is reached on July 1st, 2024. This increase in the minimum wage will provide a raise to over 71,000 people who work in Minneapolis, a disproportionate amount of whom are people of color and single mothers. 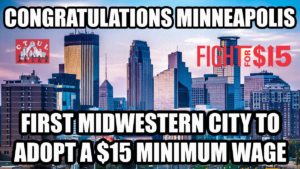 Now CTUL members and our allies will work to expand on this victory, fighting for $15 in St. Paul and other Minnesota cities, and building a strategic enforcement model that empowers workers to defend our newly won workplace rights. CTUL has worked with allies at many organizations including 15 NOW, Working America, ROC, MN Nurses Association, UFCW 653, SEIU and countless others to make this a reality. But, the initial push to open the space to dream about this ordinance came from low-wage workers across the city who courageously and relentlessly have been organizing to make a difference on the job and in their lives. 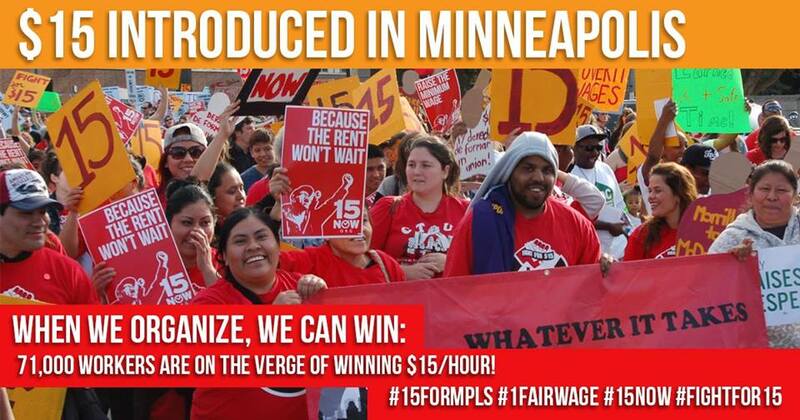 ”The passage of $15 is a victory for workers everywhere! Fast food workers across the country inspired us to fight. 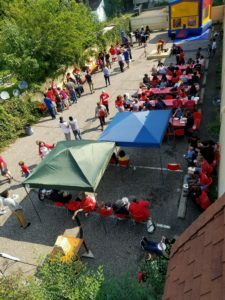 Here in Minneapolis, we organized with CTUL and other partner organizations to do what many people thought was impossible. Along the way, I was nervous. People said we were crazy and that we would never win. Just 2 years ago the city council didn’t even want to take up the issue. But look where we are now! After half a dozen strikes, protests, talking with elected officials, our struggle has become our victory. Now, we can give our children the things they need. We can buy them healthy food and give them a quality education. Thank you to all my brothers and sisters in this struggle. We won $15!! If we did it, you can do it too! ,” said Carmela Palacios, a Burger King employee and member of CTUL. 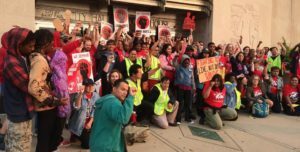 Low-wage workers across the Twin Cities have been organizing with CTUL, leading a series of strikes over the past three years to demand living wages, benefits like earned sick and safe time (which went into effect on July 1st, 2017 in Minneapolis and St. Paul), and respect and dignity in their workplaces. This leadership allowed for dialogue to be opened in between the workers most directly impacted by this issue and elected officials with the power to change it. MORE ON PAID SICK DAYS COMING SOON! “We’ve been organizing for this victory for three years and it makes me soo happy that today the City Council has finally taken a vote to raise the minimum wage. Although we faced many obstacles in this fight, we didn’t give up. We kept organizing with our co-workers, going on strike, going to shareholders meetings, and showing up to let our elected officials know that we have been fighting for this because we need it. I am very happy today.” Guillermo Lindsay, CTUL member and fast food worker. We are very proud of this victory! This is a testament to our base that when we organize, we win! This would not have been possible without the leadership of workers impacted by this very issue, and without the broader coalition of amazing organizations in the Twin Cities. All of the strikes, rallies, and risks are paying off so we will continue to fight until we have an economy that works for all of us and not just a few wealthy CEOs. This includes leading ongoing workplace fights for fair wages and working conditions, fighting for $15 in St. Paul and other surrounding cities, and organizing for strategic enforcement that empowers workers to defend our rights in the workplace. Click here to donate to support the ongoing struggle! 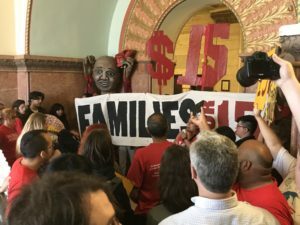 On Thursday afternoon, the Minneapolis city council held a public hearing about the proposed $15 municipal minimum wage. Testifiers voiced overwhelming support for a $15 minimum wage for all Minneapolis workers, highlighting the need for a policy with no exemptions or carve-outs, strong enforcement mechanisms, and prompt implementation. Testifiers included workers from diverse backgrounds and workplaces. Low-wage workers from fast food, retail, and other industries testified to the impossibility of surviving on $9.50 and the hardships they face. 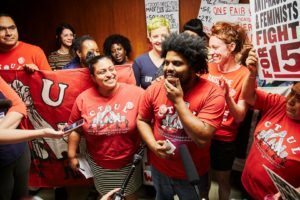 Workers from various unions, community groups, and unaffiliated supporters also voiced support for the increase, which would give a raise to 71,000 Minneapolis workers, disproportionately impacting Black, Latinx, immigrant, and female workers. Tipped workers emphasized the need for One Fair Wage of $15/hour with no tip penalty. Young workers spoke against the proposed training wage, which would mean workers under 20 years old could be paid a sub minimum wage for the first 90 days at any job. 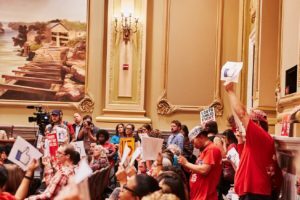 The hearing comes after years of community organizing, protests, and strikes in pursuit of a $15 minimum wage for all workers in Minneapolis. Last summer, workers collected more than 20,000 signatures to put the issue on the ballot directly to voters through a ballot initiative. Despite being one of the largest ballot initiatives in Minneapolis history and polling at 68% support amongst likely voters, the city council took the measure to the Minnesota State Supreme Court, which ruled it unfit for voters. Outside of the council chambers, supporters gathered for a moment of prayer to honor the two-year anniversary of the death of Teresa Benson, a worker leader with CTUL. 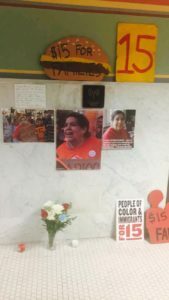 Benson was employed at McDonald’s when she passed away on June 22nd, 2015, from the compounded effects of homelessness, food insecurity, and lack of healthcare. City council is expected to discuss amendments to the proposal on June 28th at 10am in the council chambers, and vote on the final proposal on June 30th at 9:30am. 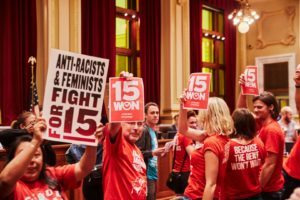 After years of low-wage workers organizing against poverty wages, the Minneapolis City Council has finally introduced the initial language for a $15 minimum wage ordinance. Click here for more information.